Reading and answering email is taking up more and more of your time at work. How could this affect your work? There is no doubt that email, with its unparalleled ability to interrupt thoughts and offer other distractions, can sap productivity and undermine our ability to concentrate at work. Some workers maintain that they can work simultaneously on email and other tasks. But in fact, “our brains aren’t able to do two things at one time," said Kathleen Nadeau, a business coach and clinical psychologist who specializes in attention deficit disorder and time management. “We are constantly interrupting one task to attend to another task," she said, “and that leads to very rapid cognitive fatigue." Is there any way that email can have a positive effect? Should you limit the number of times you check email during the day? Ideally, yes, though your ability to do that will depend on your job and your industry. 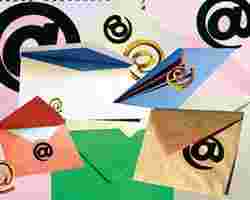 Most organizational experts suggest setting aside two or three times a day to check email. Christi Youd, president of Organize Enterprise, a consulting firm in Salt Lake City, Utah, and author of ‘Organize Your Office for Success’, recommends checking twice daily—“ideally at about 10am, when you've got an hour or two of work behind you, and then again after lunch, at 1pm or 2pm". On the other hand, Debra Condren, a psychologist, author and career consultant in New York and San Francisco, said that creating specific times for checking email could sometimes create more stress, especially if you miss an important message from your boss or a client. She also said that because people have a tendency to remember an uncompleted task more vividly than a completed one, unanswered messages may stay on our minds and annoy us. Kerul Kassel, president of New Leaf Systems, a productivity consulting firm in New Harmony, Florida, said that if it is impossible to ignore incoming email for big chunks of time, putting limits on your viewing time can help. “Limit yourself, for instance, to 10 minutes each time you check," said Kassel, who also wrote a book called ‘Stop Procrastinating Now’. What should you do when the in-box is overflowing?